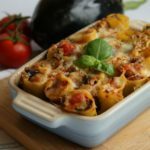 Paccheri with eggplant and tomato sauce: Paccheri pasta is a really versatile pasta that looks as though it’s just for stuffing. However, paccheri is often served with a very hearty sauce and is the perfect pasta for winter. For this recipe we wanted to show you how nice it is to prepared as a baked dish. Paccheri are very thick, large tubes of pasta that look similar to canelloni and originate in Campania and Calabria. Our Paccheri is made in the infamous pastificio of Gragnano in Campania which is why we don’t always have it in stock. Waiting for it to arrive all the way from Italy makes it worth looking forward to though, don’t you think. In a pan, fry the chopped shallots in a little oil, add the eggplant and diced tomatoes. Cook with the lid on over a low heat for 20 minutes. At the end of cooking, add salt, add the toasted pine nuts chopped coarsely. Meanwhile, cook the paccheri in boiling salted water for 2 minutes less than the time indicated. Drain and pass them under cold water. Let them dry on a towel. Chop the basil and add it to the eggplant, tomatoes and pine nuts. 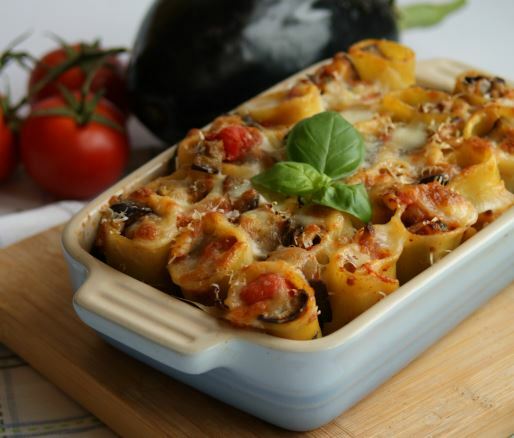 Arrange the paccheri in a baking dish and stuff them vertically with the eggplant mixture. Top with the smoked cheese and grated Parmesan. 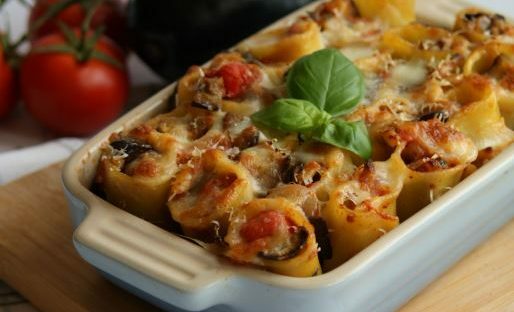 Bake paccheri baked with eggplant and tomatoes in a preheated oven at 180 degrees covered with aluminum foil, for 10 minutes, then remove the foil and continue baking for another 10 minutes. Finally, place under the broiler (grill) for a few minutes until it has formed a crust on the surface.